Meals You Can Make in 30 Minutes or Less! Bring the natural goodness of fruits, vegetables, nuts, legumes, and grains together to form delicious, heart-healthy meals that can be made in minutes. 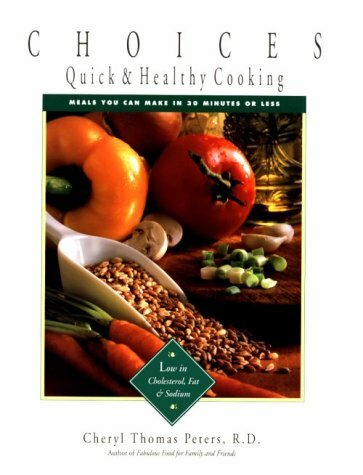 This cookbook includes more than 130 mouth-watering recipes. These meatless recipes are low in cholesterol, fat, and sodium, and loaded with great taste. Beautiful full color photos of many of the recipes entice you to your kitchen to prepare these delectable dishes. Creative Breakfasts: Need a quick breakfast idea? Who can say no to Granola and Fruit Parfait, Toasted Muesli, or a Garden Vegetable Tortilla? Powerful Portable Lunches: For plenty of get-up-and-go, try Lunch Box Burritos, Avocado Sunshine, or Waldorf "Chicken" Salad Pitas. Eat at Home Lunch Occasions: For a tasty, easy meal, choose a hot sandwich off the grill, a hearty main dish soup, or a savory salad. Dinner on the Run: Select from more than 20 international dinners that can be made in 30 minutes or less. Guilt-free Desserts: Indulge in sumptuous desserts that won''t weigh you down. * Tips on building balanced meals. * A nondairy, eggless alternative for vegan vegetarians.